Leading broadcast, network connectivity and product design expert, SIS LIVE is pleased to announce that its award-winning uPod® and DriveForce® satellite uplink system has received official accreditation for use in Brazil. The granting of satellite approval certificates by ANATEL, the National Telecommunications Agency for Brazil which is responsible for regulating and authorising service providers, sets the uPod® and DriveForce® range apart from many of its competitors. DriveForce® and uPod® are now officially accredited to deliver quality uplink services in the region. This follows on from a successful performance this summer, when the range was widely used by broadcasters to transmit news coverage from the Football tournament in Brazil. As a result, SIS LIVE received significant interest in the product, leading to further multiple sales. Leading broadcasters rely on DriveForce® and uPod® to provide a fast, reliable SNG link from even the remotest locations because of its versatility, transportability, and track record of delivering impeccable HD or SD coverage on demand. 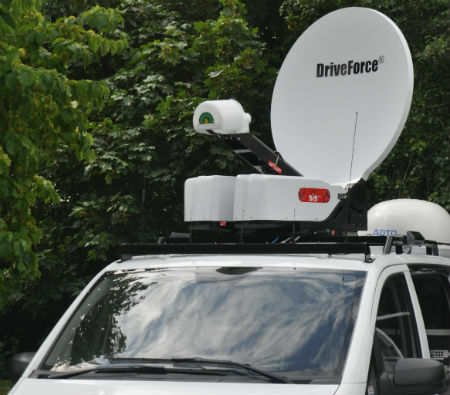 DriveForce® has a solid antenna and is designed to be vehicle mounted. The uPod® antenna is segmented, allowing it to be packed into cases and easily transported. Both are highly compact, with fully automated satellite uplink capability. The extensive use of carbon fibre in both the reflector and base construction means the system is extremely lightweight but also strong, providing thermal stability in extreme temperatures. An integrated bookings system delivers a simple and seamless satellite connectivity solution, giving newsgatherers the competitive edge. SIS LIVE products are developed and built by its in-house engineering team, based on specific requirements identified and feedback gained in the field. SIS LIVE is the only company to design, develop, manufacture and operate its own range of satellite uplink products, and heavy investment in accurate tooling and high quality, low tolerance manufacturing processes has ensured the quality and performance of its antennae. SIS LIVE’s satellite hardware division forms just one part of a wider portfolio which includes a UK and international fibre network; two teleports, NOC’s and iDirect hubs; over 500MHz of permanently leased satellite capacity; a record breaking satellite internet department; and the largest mobile satellite uplink fleet in Europe. SIS is one of the world’s leading companies in the television broadcasting industry. The company is the foremost supplier of television programming and data services to the UK and Ireland betting industry. The company’s broadcast business, SIS LIVE, operates the largest satellite uplink fleet in Europe. SIS LIVE offers broadcast connectivity solutions including global distribution via teleport and fibre, satellite internet and IP provision, and broadcast systems integration services. SIS LIVE also designs and manufactures an innovative, market-leading range of satellite products. The company covers over 100,000 hours of live events worldwide each year and delivers approximately 80% of live news feeds across the UK.